This picture comes from "A New Year's Present to the little ones from five to twelve. Part III." 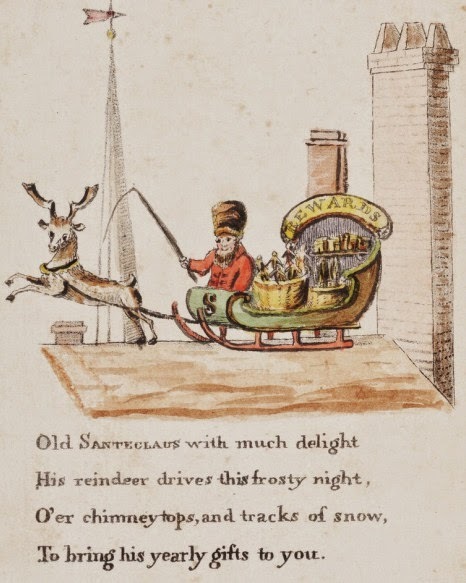 It's the first time a Santa was in a sleigh or had a reindeer. Such a simple picture but it changed the world and helped to inspire "The Night Before Christmas" which turned Christmas into a holiday about family, generosity, and wonder. For this reason this picture and poem, based on folk lore from The Forest Finns, the Dutch, the English, and the Germans has perhaps done more than all the Olympics, Nobel Prizes, etc., to bring peace and happiness to people. Modern scholars would have hated these poems if they had come out in our time, just as most critics hated "Star Wars," and many folklorists often hate Disney. The truth, however, is that good stories and art are the ones which change the world, or at least improve someone's life. They give us moments of magic, help us feel better emotionally. It's been shown that the right picture can reduce depression, improve concentration, and more. The right pictures in this case being beautiful pictures of nature, or cute things. The right stories, too can inspire generations of people, and often these works of art and stories are inspired by fairy tales. However, as I studied cross-cultural psychology focusing on folkloristics I found scholars acknowledging in the intro's and prefaces to their books that folkloristics is the driest field to study something interesting. Yet they then go on to write dry books which study the means of studying folklore. Yes this is useful for textbooks, but it serves only one real purpose, to help scholars understand scholarship. In order to make these scholarly articles and books relevant for people we have to use them to make books that are interesting as useful for other purposes. Briggs, has done a great job with this in her books on fairies, but such scholarship is limited to England and only goes so far. I wanted to create something different, something with a purpose, and the purpose I chose was to help writers and artists, because they can change the world. 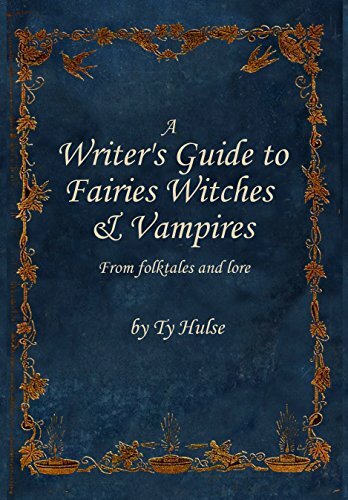 Yes the things that artists and writers say they want such as archetypes are things that scholars hate, but there are lots of books on folklore that are useful for scholars, and hundreds of journal articles published every year as well. So while I may pour through scholarly articles, books, etc., most of us have to have a different purpose than just writing these articles, we have to apply them to something. I've decided to apply them to help the people who make the world a more beautiful place through stories. The world is filled with desperate people, but this was even more true in ancient times when women were forced to marry men who often didn't love them in distant villages where they were treated as outsiders by every human around them. Men too, could find themselves leaving home because there wasn't enough food in the village to feed them, then unable to find work they found themselves starving to death, looked down on by everyone around them. In lore some of these people were lucky, they found a fairy who was willing to help, but not all fairies are helpful. Seeing an opportunity to pump up their ego, to take advantage of a lonely and desperate person many of the less kind fairies would attach themselves to the lost. They would give the lost magical secrets and aid in return for their complete emotional, physical, and often sexual subservience. The fairies attached to The Lost were aggressive, controlling, and fickle. Acting like an abusive husband they would beat and torment the witch to get their way. The Lost couldn't leave even if they wanted to, for they were trapped in a supernatural relationship, however, they seem to have started to justify their relationship with the fairy, and become proud of it. The Lost had so little control over everything that they reveled in the magical powers they gained, but like children they often bragged about things they shouldn't have. They used their powers to threaten and blackmail the people around them, often trying to gain control over something. Thus many of these witches were found out because they would publicly yell at people that they would curse them to die, or because they would use their powers of divination to find out a powerful persons dark secrets. Things would get progressively worse for The Lost, until at last the fairy bored of them and left. Grief stricken and relieved The Lost might swear that never again would they find themselves in such a situation, but there were are always more fairies looking to boost their ego through a relationship with a human. And in the end The Lost desires the feeling of power that comes from magic, even if it requires the abuse of something cruel. Examples: Hermes, "Jack and the Bean Stalk," hero in "Devil and the Three Golden Hairs," Hero in "The Drummer," and many, many more. Perhaps the most common witch in fairy tales, the Luck Born are some of the most liminal of witches, for in fairy tales the pop in and out of the spirit realm with such ease, and gain spirit allies so readily that people hearing the story often don't even realize they are using magic. Free loving and free wheeling they are quick to accept any task placed in front of them, and quick to befriend or trick any spirit at will. The hero of "The Drummer," for, pretends to be leading an army in order to force a giant into carrying him to the glass mountain (the other world). Lucky Born are willing to work hard to accomplish their tasks, but at the same time, they are also willing to just lay down when a task is impossible and assume it will resolve itself, because for them it almost always does with the help of kind fairies. Fairies have always helped them, and always well, because the fairies like the kind free wheeling nature of the Luck Born. Again going back to The Drummer, he's the only protagonist I know of who ever returned the shift of a fairy when he got a hold of it. Most stories of swan maidens, sky women, sealkie, etc, involve someone stealing these to gain power over the fairy. The Drummer, returned it immediately once he learned it belonged to someone. Then he risked his life to rescue the fairy whom it belonged to, despite knowing very little about her. The one serious flaw with Luck Born is that since they think everything will always turn out, that the beans are magical, that if they just lay down some fairy will come along and do their work for them, etc. And they love to be helpful, they are quick to give advice, which won't work out very well for anyone else. There are many childish fairies, playful and curious, they tend to live on a constant roller coaster of emotions, going from extremely rambunctious highs to terrible fit throwing lows very quickly. Adventurous these fairies love taking risks, love to cause mischief and trouble. They constantly need to be the center of attention and crave positive feedback from others, which leads them to be show offs. 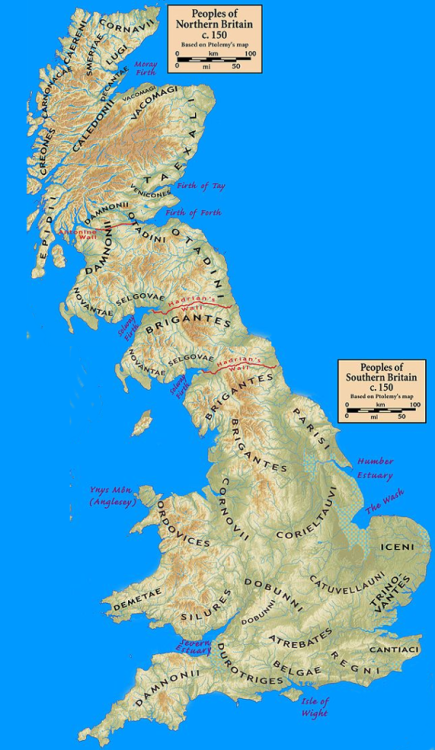 Ainsel of Northern England is a good example of this. A soot covered fairy who bursts out down chimneys to play with, and show off for, human children. The Mocachicchio of Italy are also another good example. These fairies love to play with human children, especially games in which they can act the part of the leader. When things don't go their way they can quickly become demanding and rude, and when things really don't go their way they become emotionally overwhelmed and begin weeping. Filled with powerful and often overwhelming emotions, fate bringers are the most extreme version of the artist archetype. Unlike human artists who are limited to telling stories or painting pictures, fairies manipulate the fate, the story of humanity is their greatest art. The they can create the story of "Sleeping Beauty," rather than having to tell it. Banshee's are a good example of this fairy. Ancestral spirits who are so in love with their human family that they cry until their eyes turn red when they learn that someone they love is going to die. They do not cause this death, however, instead they bring the gifts of poetry and greatness to their family members. 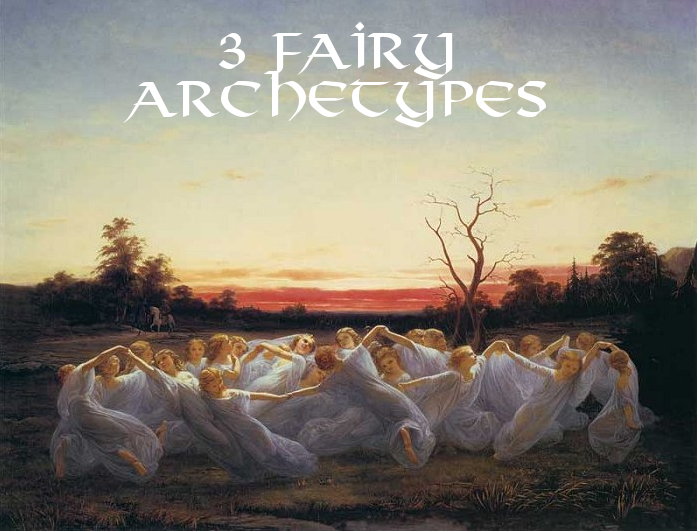 The fairies of "Sleeping Beauty" were another example of this archetype. Happy to help, but also so easily offended they were willing to curse a baby to die. Water mothers love purity, beauty and serenity above all else, which makes them extremely important for villages which need a clean source of water. Dwelling in pools they have a naturally caring nature, helping the people of the village almost as they would children. Yet their sensitive nature means that they are easily offended by swearing, by immoral behavior, and most of all filth. The Rusalka, for example, were so offended by immorality that they left their homeland to find a new place to live. The "But Aba" of the Mari-El are a good example of this fairy. Choosing to adopt a village keep the lake or river clean for the people to drink, most of the time. If they get too upset however they became depressed and listless. In this state they allow the lake to grow filthy, requiring the people to give the gifts (porridge or the blood of a black hen are common though fishermen often give them vodka as well). She loves to engage the people of her village, so when new wives move to the village they would introduce themselves to the lake and give it a little porridge. Further at various times of the year the village would have a feast by the lake in her honer.